A caper! Last week, for the first time in its 51 years, Doctor Who tackled a heist story. And for 45 minutes, the show fully embraced the genre. There was the team of bank robbers with unique skills. The un-break-in-to-able vault. The surprise twists. Even a flashback at the end to fill in all the blanks. And the direction by Douglas Mackinnon — who was also behind the viewfinder for "Listen" — matched the script step for step. There was badass slow motion, a heisty soundtrack, plus lots of wipes and other fancy "Hustle"-style cuts. Of course, that's one of the show's most famous strengths. The premise allows the writers to tackle pretty much any story they want in any genre they want. In this half-season alone, we've seen a Fantastic Voyage-esque quest in miniature and the Robin Hood romp of "Robot of Sherwood". And over the course of the last half century, we've seen everything from horror to comedy, from historical dramas to futuristic space missions, from murder mysteries to action adventures... and on and on and on. While most television programs are naturally forced to maintain one consistent genre for their entire run, Doctor Who adapts itself to whatever story it happens to be telling that week. A little, you might say, like Saibra in "Time Heist" — whose face changes to match the face of anyone she touches. Or even the Doctor himself — whose face has changed so many times over the years. And who, this week, adopted yet another facade: the mysterious Architect. The first half of this season has been all about that kind of change. The Doctor's most recent regeneration was easily one of his most dramatic. And the show has been exploring the contrast between this abrasive Twelfth Doctor and the flirty faces who preceded him. Almost every episode of Season Eight has been thematically centered on the idea of the Doctor trying to figure out exactly who he is. As he begins an entire new regeneration cycle, he's been learning which parts of his personality are the passing peculiarities of individual incarnations and which are the core elements that make him who he is. Some of those answers haven't been pretty. At times, he's been not just grumpy, but downright unkind. Psi's accusation of professional detachment seems particularly biting given what we've seen so far this year. In "Into The Dalek", the Doctor is callous — unmoved by the death of the first soldier killed by the antibodies. Even worse than that, when Rusty The Dalek looks into the Time Lord's soul, what he finds there is genocidal rage. But "Time Heist" finally showed us the other side of that equation. This was the Doctor we know and love. The fearless, problem-solving leader. The Time Lord wiling to risk his own life to save the lives of others. And this week, when it seemed like the people around him were dying in much the same way they did inside Rusty The Dalek, it turned out in the end that the Doctor had found a way to save them. Not only that, he also managed to get them the things they wanted most in the universe. Most heart-warming of all, we see what the Doctor himself wanted out of the heist: to save the Teller and the Teller's mate. It seems the thing our favourite Time Lord wants most in the universe is to save a species. To do good. To be a good man. 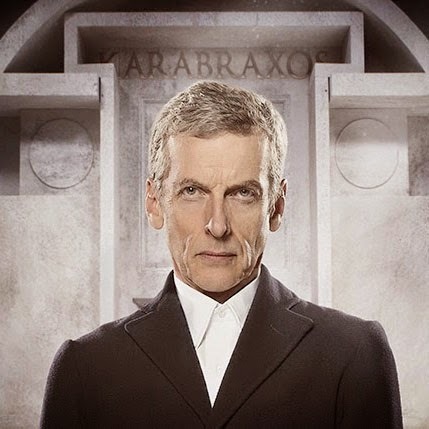 It was a welcome reminder in an unsettling season: while the show might race from genre to genre and the Doctor's face might transform from a goofy youngster into a stern and greying man with scary eyebrows, there are still some things that haven't changed at all. - My favourite moment of the episode: while the dashing Doctors ran all over the place, the Twelfth runs out of breath and gets his companions to stop running. - Um, while he wiped his own memories of the plan for the bank heist, isn't the Doctor full of lots and lots of guilt about other stuff? You would think that might come up. - Psi is called "half-computer", so this season's robot theme seems to be continuing. - Lots of memory-themed stuff this week, which was been a frequent feature of the Moffat era. In fact, I wrote a whole post about it after the Christmas special. - I'm ever building an impregnable space bank, please remind me not to include lots of convenient, human-sized vents. - "She hates her own clones," they say of Madame Karabraxos. Which echoes the Doctor's attitude toward himself whenever he meets another one of his own incarnations. And his attitude toward the Architect, too. Read our next recap — "Doctor Who's Elitist Jerk of a Time Lord" — or our previous recap: "Doctor Who & The Monsters Under The Bed". This post posted by Adam Bunch, the Editor-in-Chief of the Little Red Umbrella and the creator of the Toronto Dreams Project. You can read his posts here, follow him on Twitter here, or email him at adam@littleredumbrella.com.